For the first compairson in this series, click here. As the first comparison in this series can be viewed through the question of how specific places can be seen to have signifying capacity, the following juxtaposition demonstrates a parallel engagement with this idea on a much larger scale: the comprehensibility and transparency of the world as a totality. Developed for both the Expo 2000 World’s Fair in Hanover and the 2000 Olympics in Sydney, Shawn Brixey’s unrealized work Epicycle was proposed to address the requirements of a large-scale public work of technological art that had no language barriers and required no specific knowledge set to comprehend. 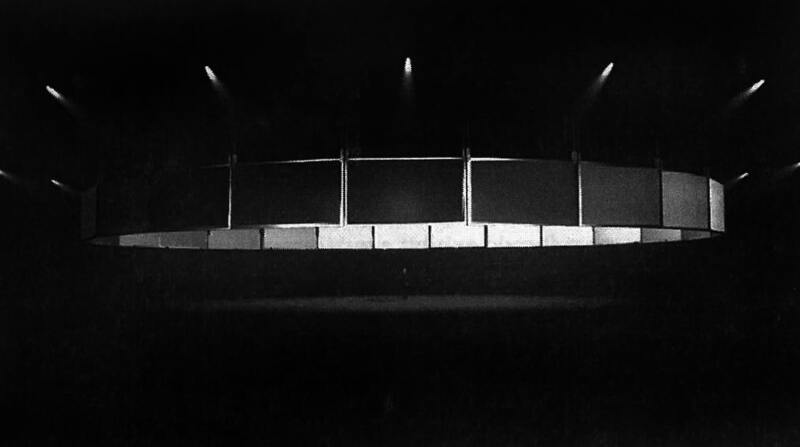 The piece, in the artist’s description, would have enabled viewers to stand “telepresent” on the entire circumference of the globe by means of a “a seamless digital video horizon.”1 The installation was designed as a circular array of twenty-four rear-projected screens, each corresponding to one of the earth’s twenty-four time zones. Each screen was to be linked to a camera that would average the luminance of the local sky at that site, transmitting this information as a single brightness value. At the top of the hour, each transmission would be routed to the adjacent screen, achieving a rotational effect that would run counter to the earth’s spin on its axis. Though the piece itself was never realized, the concept of Epicycle provides a window of how theorizations of the world-spanning reach of the digital have evolved within the last decade and a half. Broadly speaking, Brixey’s work has focused on the use of networked technology to make physical or energetic phenomena manifest within the space of the gallery. Experiments such as Sky Chasm (1987), presented at Documenta 8, position Brixey as one of the underappreciated pioneers of the current florescence of data visualization seen as digital art2. Indeed, Epicycle stands as one of the earliest, specifically digital examples to figure the physical space of the globe as a newly comprehensible totality. The vocabulary around this piece—of “telepresence” and “seamless digital horizons”—speaks to the perceived possibility of transforming the world through the language of what was until recently referred to as “cyberspace,” the frictionless, uninterrupted aether of the digital network3. This work provides a geographically focused articulation of a pervasive optimism that surrounded the early popularization of the World Wide Web, representing the dawning of what Marshall McLuhan had seen, several decades earlier, as the nascent “global village.”4 While artists such as Douglas Davis eagerly explored the ways in which the internet could provide a connective fabric to catalyze the emergence of a collaborative culture, the imagined Epicycle seeks to go farther. Bathed in the static glow of twenty-four enclosing screens, viewers serve as universal timekeepers of a planet that has become a digital simulacrum of itself, at once completely visible and radically delocalized. The attempt to view the world as a totality through its distorted representation was of primary importance to Robert Smithson. Though he was eventually canonized within the pages of art history for his large-scale interventions in the natural landscape, Smithson’s earlier work reveals an important investigation into the complex relationship between human artifacts—such as gallery sculptures and world maps—and the places in the world they are intended to depict. Early in their careers, Smithson and his close friend Mel Bochner collaborated on a singular, strange publication that contained the germ of many ideas that would animate their practices for several years. “The Domain of the Great Bear,” published in the Fall 1966 issue of Art Voices, was part imaginative fiction, part philosophical treatise, and part event proposal. It used the Hayden Planetarium in New York as a ground for complex, metaphorical speculation about the nature of infinity, the limits of comprehension, and the possibility of perfect maps. 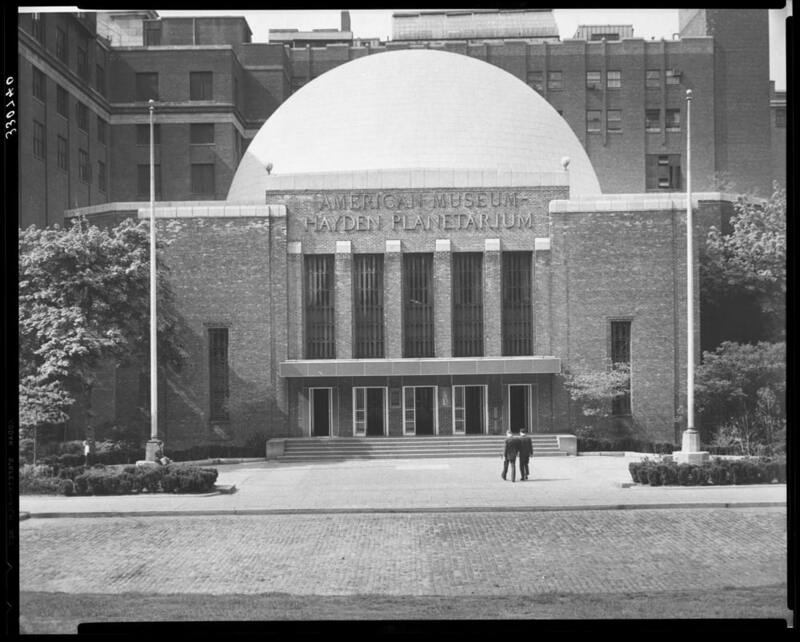 It also proposed the planetarium as an arena in which to enact a gesamkunstwerk production involving an educational lecture and a demonstration of the orbiting planetary models. Hayden Planetarium, American Museum of Natural History, New York. Image #330740, AMNH Library (photograph © American Museum of Natural History, photograph provided by AMNH). The 1966 article opened with a quotation from the Argentinean author Jorge Luis Borges, an enormously popular figure among intellectually minded artists of the period: “There is a labyrinth which is a straight line.”5 Bochner in particular would return to this quotation frequently, both citing it in print and incorporating it into installations. For both artists, the conception of a paradoxical line—one that was both straight and labyrinthine, infinite and measured—began to function as a figure for the epistemological difficulties inherent in flat representations of a spatial world. Smithson soon began to apply this notion of an inherently distorted spatial representation in his sculptural practice. For his 1967 solo exhibition at the New York location of the Dwan Gallery, Smithson showed a group of white-painted, steel sculptures. Among them was Pointless Vanishing Point, a sloping five-tiered staircase whose title connected to a larger shift in Smithson’s emerging artistic practice. Though Pointless Vanishing Point anticipated Smithson’s theorization of the white-cube gallery as a “non-site,” its significance for us lies in the way that it reifies the false assumptions of transparency that underlie the production of a mappa mundi. Brixey’s later work seems to provide an apotheosis of this transparency seen from Smithson’s polar vanishing—an image of the world seen from everywhere, but reduced to a circumferential, ambient glow. Mike Maizels is teacher, curator, and scholar interested in the long tail of the artistic innovations of the 1960s. His first book, forthcoming from the University of Minnesota Press, focuses on the artist Barry Le Va. A second book, currently in progress, will examine the intersection of experimental art and music in the 1960s. More recently, his research has lead to a larger interest in newer forms of “variable media,” including electronic and digital art. Maizels’s other academic interests include the histories of science and subjectivity, as well as the intersection of art criticism and art history. He is currently the Mellon New Media Curator/Lecturer at the Davis Museum at Wellesley College.